As a welder, you already know how important it is to protect your eyes on the job. All it takes is a flying piece of slag or a little too much ultraviolet radiation to permanently damage your vision. With an infinite number of options to choose from, finding the right hood can be overwhelming. Fortunately, we’re here to clear up the confusion and help you find the best welding helmet to suit your needs. Keep in mind that, before you purchase anything, you should always make sure that the helmet meets the current ANSI standards. These safety guidelines ensure that the hood is able to fully protect you from flying debris, UV-rays, and extreme temperatures. Although most hoods will offer the same level of protection, the features they come with can vary. Your working conditions and level of experience will determine which type of welding helmet you need. Most welding helmets fall under two categories: single shade or variable shade. Single shade hoods—also called passive helmets—use a dark-tinted ultraviolet (UV) and infrared (IR) filter with usually a #10 shade. These helmets provide the same level of protection regardless of the amperage. Since they only operate with one shade, you have to lift the passive helmet up once you’re done working so that you can see clearly. When you’re ready to begin welding again, the hood must be flipped down first. The variable shade helmet, however, doesn’t need to be continually flipped up and down. This hood has an auto-darkening filter designed to sense the welding arc. When you aren’t actively working, the lens will usually remain at a #3 or #4 shade. However, once you begin welding, the auto-darkening filter will automatically switch to a shade in the range of #9 to #13. One reason some welders tend to prefer the variable shade hood is its convenience. Unlike passive helmets, you don’t need to keep flipping the helmet up or snapping it back into place. In the midst of a complicated job, you won’t have to worry about your helmet. Identifying the best welding helmet between these two types is not easy. Both types of hoods have their advantages: while single shade helmets are extremely durable and may be a smarter choice economically, a variable shade helmet may function better when you’re doing complex or intricate work. Although reaction time won’t be a consideration for single-shade helmets, it’s a big deal in variable shade hoods. Reaction time refers to the amount of time it takes the lens to darken once you’ve begun welding. Reaction time, or switching speed, plays a large role in preventing eye injuries. Even momentary exposure to a welding arc without protective eye gear could result in an injury like flash burn. There are three main kinds of switching speeds: entry-level, intermediate and professional. Entry-level speeds typically range around 1/3,600 of a second while a professional speed could be as quick as 1/25,000 of a second. If you’re only welding for short amounts of time, the specific switching speed might not matter. However, if you’re going to be welding for hours at a time, an entry-level speed could cause eye fatigue or strain. In this case, an intermediate or professional setting might be beneficial if you know you’re going to be working a lot of long, tiring jobs. Another factor in finding the best welding helmet is battery power. While single shade hoods don’t need to be powered, variable shade helmets do. The type of power can vary too: some auto-darkening helmets feature solar assist panels, while others contain lithium or AAA batteries. In some cases, a welding helmet might even have both solar panels and batteries attached. Each power option has its own advantages. Helmets that only come with solar assist panels won’t need to have batteries replaced, but they might require you to charge them in the sun before usage. Helmets with AAA batteries tend to be more economical and accessible, but lithium batteries may last longer. If you don’t like replacing the batteries in your welding helmet, a lithium or solar-powered helmet might be the right choice. However, if you’re looking for a convenient option that’s widely available, a helmet with AAA batteries may be better. Welders who work frequently—especially for hours at a time—might struggle with serious neck issues. 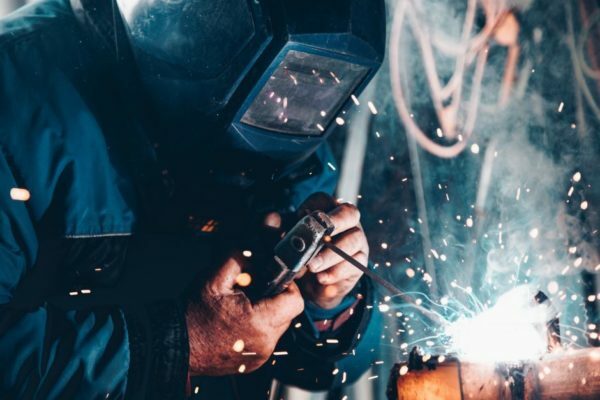 The American Welding Society has recognized the strain that welding can have on your neck and spinal column as well as the benefit of using a lighter weight helmet. If you know that you’re going to be welding for a significant amount of time, it might be worth it to invest in a lighter-weight helmet. Even just one pound can make all the difference when your head is strained for hours. With so many options to choose from and features to compare, choosing the best welding helmet can be an impossible task. Fortunately, we’ve got your back—here are some of our favorite welding helmets on the market today. 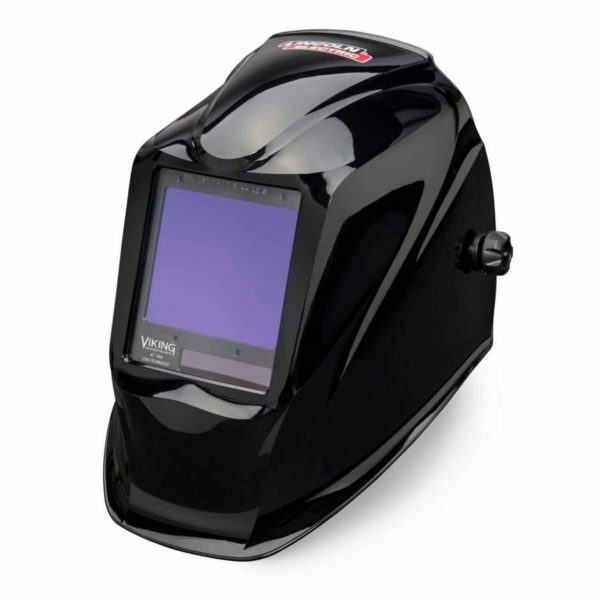 This auto-darkening welding helmet offers a wide range of shades—from a #3 to a #13 shade. While it is in a light state, the filter displays a yellow-green color that can help prevent eye strain and reduce harmful blue light. If you’re not happy with the shade, there’s a sensitivity knob on the side for manual adjustment. The lens also features a wider viewing area for more visibility and comes with 4 premium sensors. All of these sensors work together to detect the welding arc so that the shade can switch as quickly as possible. The reaction time is set at the professional setting, so you can expect your switching speed to be less than 1/25,000 of a second. This helmet is designed to be comfortable and lightweight: the hood only weighs 14 ounces, and there’s an adjustable headband. The headband allows you to rearrange the helmet’s position to be more comfortable any time you’re working. Power-wise, this product uses an eco-friendly lithium battery. You might find that this helmet is particularly useful in arc-air gouging, plasma beam cutting, microplasma arc welding, and electrodes shielding. If you’re worried about the helmet malfunctioning or suffering damage, the manufacturer does offer a 24-month warranty. Lincoln Electric’s auto-darkening helmet is made of a combination of durable polycarbonate plastic and nylon. The wide lens is designed for optical clarity and gives the operator a large display area (3.74”x3.34”) to see their workspace from. The lens will change from a #5 to a #13 shade and allows for manual adjustment. The reaction time on this helmet is professional-grade—your switching speed should be around 1/25,000 of a second. Although there is no electromagnetic sensor, it does come with 4 sensors that will control how well the filter can detect your welding arc. 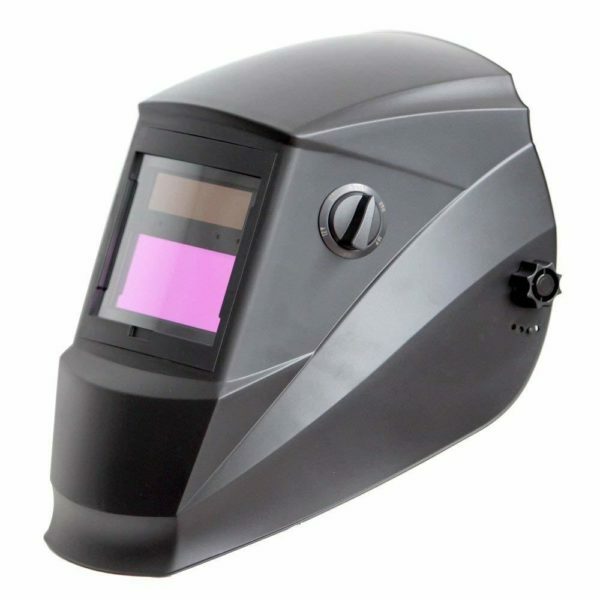 The Lincoln Electric welding helmet features a combination of solar and lithium-power: while it does contain solar panels, it also requires one metal lithium battery too. Weight-size, this product is a little on the heavier side at 3 pounds. There’s an attached ratchet on the helmet for easy adjustment while you’re working. One advantage of the Lincoln Electric helmet is its grind mode. Not only is this setting convenient, but it’s safer for the operator as well. Instead of having to take off your hood to manually adjust the settings, switching your helmet to grind mode is as simple as pushing a button. 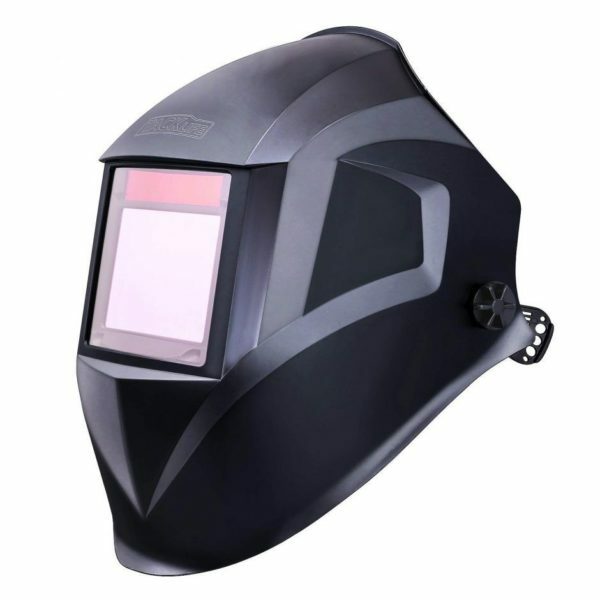 Whether you order it in dark grey or the USA-flag pattern, the Tanox welding helmet provides the same viewing area (3.86”x1.73”). The lens is adjustable and will switch from a #4 to #13 shade. If you aren’t satisfied with the automatic settings, you can always manually adjust the filter by using the infinity dial knob. 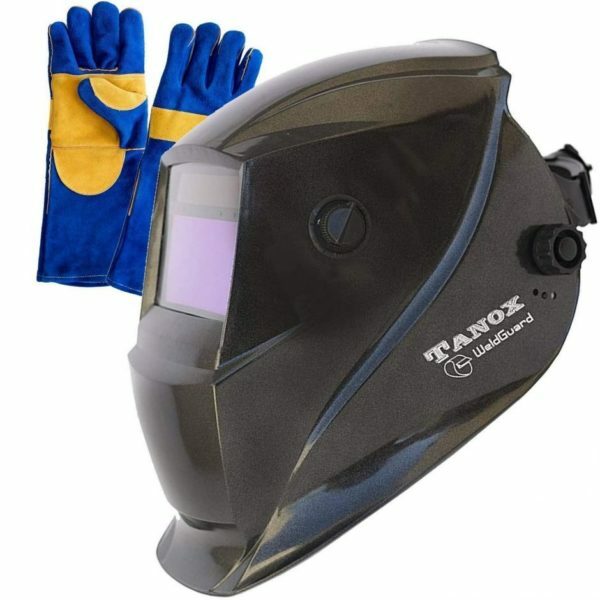 Like its competitors, the Tanox welding helmet also offers a professional-grade reaction time by going from dark to light in 1/25,000 of a second. As far as battery power goes, this helmet is powered by a combination of solar cells and a lithium battery with a life span of 2 years. The hood is fairly lightweight at only 1.6 pounds and includes a padded head adapter so that you can be a little bit more comfortable while you’re working. Not only does the Tanox helmet come with a risk-free, satisfaction guarantee, but each purchase also contains an extra lens cover and a pair of thick, double-layer welding gloves with Kevlar stitching. For only a few dollars more, you can actually purchase the Tanox welding helmet in a bold, USA-flag pattern if you’re feeling patriotic. If that’s too brazen, there’s the standard dark-grey option too. The Antra auto-darkening helmet is extremely receptive to electric arc projects and plasma applications. The hood features 4 smart chip-controlled sensors and includes #5 to #13 shade options. It’s a lightweight choice, only weighing in at a pound. The reaction time on the helmet professional-grade so that the hood can switch from a dark to light filter in less than 1/25,000 of a second. Power-wise, the Antra helmet is solar-powered but also contains 2 replaceable CR2032 batteries. Along with its solar capabilities, the hood has interference suppression technology to help prevent false triggering caused bright sunlight and lighting. The power-off delay also saves energy by keeping the filter on for ten minutes in dark environments before shutting it off completely. On shade 4, the grinding feature will stop you from having to remove your helmet to make manual adjustments before grinding. If you don’t like the auto-darkening options, there’s a built-in passive filter that will provide permanent UV/IR protection. The Antra helmet is also fairly light—weighing only 1 pound. For a little bit of extra comfort, there’s also a sweatband included. When you’re working long hours in extreme heat, the sweatband may keep you from becoming too clammy. As an extra bonus, this product also includes six exterior lens covers with the purchase of the helmet. 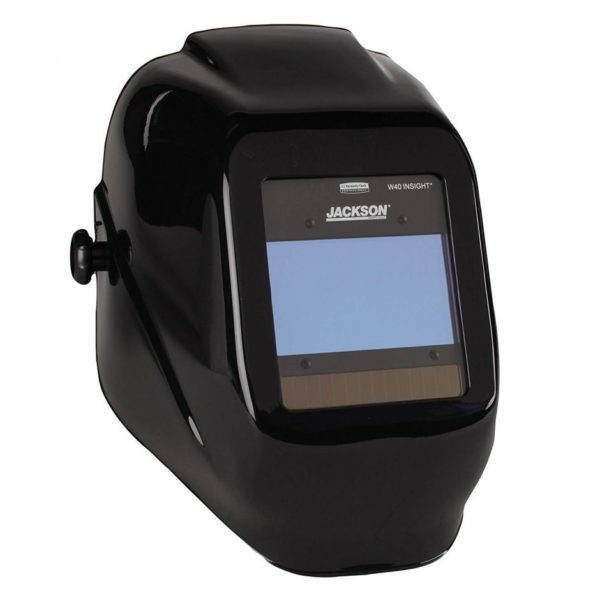 The Jackson Safety welding helmet is all about convenience. While it does include comfort features, this hood centers around efficiency and safety. With a range of shade options available (#9 to #13 shades) and auto-dimming sensors, the lens can quickly shift from dark to light. If you prefer to adjust the shades manually, the helmet contains easy-to-use digital controls and independent sensors that are designed for quick, convenient use. In work environments with sensitive lighting, you don’t need to worry about the flickering lights affecting the filter on your helmet. This hood includes adjustments for sensitive light sources and ambient lighting. The viewing area on the lens (3.94”x2.36”) is wide enough for you to clearly see your workspace through the auto-darkening filter. Although this helmet tends to be slightly heavier than others at 2 pounds, the extra weight may be worth it. The helmet is comprised of nylon, a material designed for durability. In extreme weather conditions, a nylon helmet might fare better than a polyester or plastic one. The Jackson Safety helmet uses lithium batteries as its power source. While slightly less economical, these replaceable batteries are known for having a long life span. While each of these welding helmets offer their own advantages, our favorite is the Pro Welding Helmet with Highest Optical Class. Not only does it offer a wider range of shade options, but the auto-darkening lens is designed to be versatile. Unlike some of our other top choices, the Pro Welding Helmet combines two essential components of welding: function and comfort. The simple controls are easy to work, and the lightweight helmet has an adjustable strap. Whether you’re working at a construction site or a mechanic’s garage, the Pro welding helmet can help keep you relaxed and focused on your work.